I have had an altar space in my home for several years. It’s where I keep my candles, guidance cards, essential oils, palo santo, sage, crystals, etc. — special things. 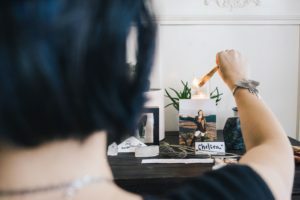 I typically meditate and journal near my altar in the morning, pulling out whatever support I am drawn to invite in for the day. In many ways this area of my house is simply an extension of my witchy-mystical style since there is no shortage of spiritual things throughout my entire home. However, recently I have become much more aware of the sacredness of my altar and the importance it has in my life. In a relatively short period of time I lost my dog, my dearest friend and my home. In my time of navigating grief without a stable living environment I have developed a completely new relationship with my altar space. When I had to unexpectedly move out of my apartment in San Francisco I chose to live without a home for a while because it seemed like an adventure and an opportunity to connect more deeply with my community — and — you have to have your wits about you to find a place to live in SF and I did not have my wits about me. I was grieving, overwhelmed and lost. I have been grateful to be welcomed into incredible spaces with wonderful people during this time of transition, but I have sorely missed my sense of home. Feeling at home is something I have learned to do wherever I am and having an altar has supported that learning process. Now, the first thing I do when I arrive in a new space is set up my altar. My altar has become a physical anchor for the things that bring meaning to my life. Setting it up is one of the things I do to soothe my nervous system, which is rightly outraged by all my bouncing around from place to place. In the challenging last few months, having my special things with me has given me a necessary sense of consistency across my ever changing environments. An altar is not a collection of random things. The items we place on an altar are infused with energy and meaning. 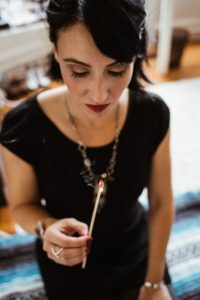 Connecting with altar items is a way to help our inner sacredness find a home in the physical world. Each of these items is a physical representation of a meaningful memory or a symbol for something I want to remember to carry with me every day. The practice of setting up and spending time at my altar has also become a very important way for me to honor the loved ones I have lost. I have found great comfort in keeping photos and special things related to Peso and Chelsea on my altar. 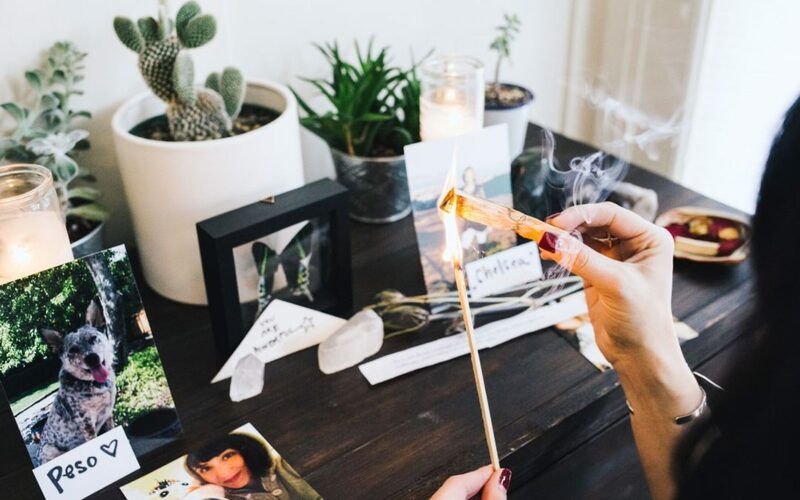 Lighting a candle and spending time in this space is how I take time for myself to feel my connection to them and honor the energy they have brought and continue to bring to my life. I don’t think I would have known or appreciated the power of my altar had I not found myself unexpectedly moving frequently between environments that are not my own. Now, having been comforted for months by the ritual and routine of setting up and spending time in a sacred space, I doubt this is a practice that will ever leave my life. I am, as always, grateful for the wisdom challenge illuminates in my life.